New research from IBM shows, however, that although Millennials prefer a more social and casual work environment, they closely line up with Baby Boomers and Generation Xers when it comes to “things like career goals, employee engagement, preferred leadership styles and recognition.” [iv] Indeed, the researchers found that the “digital proficiency” of Millennials is their main distinguishing factor. While Millennials may not be as different from other employees as we might have thought, harmoniously integrating them into the workplace still poses challenges. As more employers are integrating Millennials into the workforce each year, it’s important to understand who these young workers are and what they value, and for Millennials themselves to disprove the widespread misconceptions about their work ethic. 4 things to consider about Millennials in the workplace: What do they value and how should employers work with them? Millennials aim to quickly complete projects, not clock hours. [xii] They don’t want to waste time guessing their superiors’ expectations and therefore value clear directions and regular feedback. Millennials hope to advance professionally and intellectually. Of the Millennials surveyed by MTV, 89% agreed that “it is important to be constantly learning” at work. Employers can capitalize on this desire to learn by letting Millennials take on new tasks and responsibilities when they’re ready. They value the insights of more experienced professionals. Three quarters of Millennials want a mentor, and two thirds would be willing to help older colleagues hone their technology skills. [xiv] Proactively connecting young workers with more senior employees could benefit everyone. Millennials want to know how their work supports their company’s overarching goals. As Gillenwater explains, 60% of Millennials say “a sense of purpose” attracted them to their current employers. It’s important for an organization to define its mission, culture, and why each employee’s contribution matters. How can Millennials earn a better reputation in the workplace? Effective communication requires cooperation. Although Millennials may favor digital communication, they need to recognize that their older colleagues may prefer phone calls or face-to-face interactions. [xvii] Millennials should identify their coworkers’ norms for communicating and adapt accordingly. The best way for Millennials to show that they’re ready to take on new responsibilities is to excel at their current ones. They should set achievement goals for themselves and work hard to accomplish them. [xviii] While a company might have a clear mission, it’s ultimately up to Millennials to prove that they valuably support it. Since Millennials actually have much in common with their older colleagues, understanding who they are and what they value in a workplace offers several benefits for companies. It helps them attract, integrate, and retain these techy, social media-savvy workers, and also provides insight into how companies can improve their organizations to benefit employees of all ages. hfi’ s new Employability Review covers PI-5 (our personality indicator) as well as our MVQ (Motivational Values Questionnaire). This review is cost effective and the ideal tool to help you understand which millennials to hire and how to engage effectively with them. To find out more, contact us today! [i]Holland, Kelley. “A Big Chill: Millennials Learning Harsh Reality of Workplace.” NBC News. Web. 2 May 2014. [ii] Peterson, Kim. “Are millennials too spoiled for the workplace?” CBS News. Web. 10 December 2014. [iii] Hillhouse, Alison. “Consumer Insights: MTV’s ‘No Collar Workers’.” Blog.Viacom. Viacom. Web. 4 October 2012. [iv] “IBM Study: The Real Story Behind Millennials in the Workplace.” Technology Business Journal. NewsRx, LLC, 2015. Web. 3 March 2015. [v] “Millennials Outnumber Baby Boomers And Are Far More Diverse, Census Bureau Reports.” United States Census Bureau. Web. 25 June 2015. [vi] Fry, Richard. “Millennials surpass Gen Xers as the largest generation in the U.S. labor force.” FactTank. Pew Research Center. Web. 11 May 2015. [vii] Fry, Richard. “Record share of young women are living with their parents, relatives.” FactTank. Pew Research Center. Web. 11 November 2015. [xi] Gillenwater, Ray. 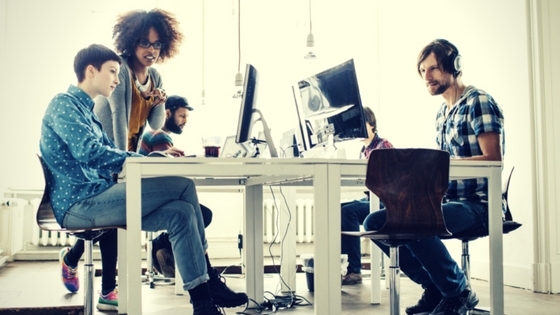 “Why Millennials in the Workplace ‘Don’t Care,’ and 4 Things You Can Do.” Entrepreneur. Web. 29 May 2015. [xii] Gillaspie, Dixie. “5 Ways Millennials Are Like No Generation Before Them.” Entrepreneur. Web. 13 March 2015. [xv] Restle, Hope. “A CEO shares his best advice for getting promoted quickly when you’re in your 20s.” Business Insider. Web. 19 August 2015.